and/or modernisation of nuclear weapons for the US, Britain and France. Of these 14 companies 6 have subsidiaries in Canada that are exhibiting at CANSEC 2018, in Ottawa May 30-31. One nuclear-weapons company, General Dynamics, has three subsidiaries at this military trade show. NOTE: The "Corporate Complicity in Nuclear Weapons Production, Maintenance &/or Management"
that is detailed below relates to the work of parent company and not the subsidiaries at CANSEC. Coalition to Oppose the Arms Trade (COAT), May 26, 2017; Updated March 22, 2018. BAE Systems is involved in the US and UK Trident II D5 strategic weapons system programmes. It is also the prime contractor for the US Minuteman III Intercontinental Ballistic Missile (ICBM) system. BAE Systems is also part of the joint venture providing medium-range air-to-surface missiles for France. Boeing is involved in Minuteman III nuclear ICBMs in the US arsenal. It also provides the US and UK Trident II D5 with maintenance, repair, and rebuilding and technical services. Babcock & Wilcox manages and operates US nuclear weapons facilities including the Lawrence Livermore National Laboratory, Los Alamos National Laboratory, and the Nevada Test Site. These are engaged in nuclear warhead modernisation and testing. Fluor is the lead partner responsible for the management and operation of the US Department of Energy’s Savannah River Site and Savannah River National Laboratory, the only source of new tritium for the US nuclear arsenal. General Dynamics provides a range of engineering, development, and production activities to support to US and UK Trident II Strategic Weapons Systems. It is also involved in the guidance systems of the Trident II D5 nuclear missiles of the US Navy. Honeywell International manages and operates the National Security Campus where an estimated 85% of the non-nuclear components for US nuclear weapons are produced. It is also involved in tritium production at the Savannah River Site and produces components for integrated circuits for the Trident II D5 nuclear missiles of the US arsenal. Huntington Ingalls Industries is involved in management of the US nuclear arsenal, and in tritium production at the Savannah River Site, the only source of new tritium for the US nuclear arsenal. Jacobs Engineering Group is involved in the joint venture AWE-ML, which manages the UK Atomic Weapons Establishment, that designs, manufactures and maintains nuclear warheads for the UK. Larsen & Toubro is responsible for developing the launcher system for the nuclear-capable short-range surface-to-air Akash missile system for the Indian nuclear arsenal. Lockheed Martin is responsible for the construction of the Trident II D5 nuclear missiles for the US and the UK. It is also involved in the production and maintenance of the Minuteman III nuclear intercontinental ballistic missiles for the US. It is part of the joint venture AWE-ML, which manages the UK Atomic Weapons Establishment, that designs, manufactures and maintains nuclear warheads for the UK. Northrop Grumman is involved with production and maintenance of the Minuteman III nuclear ICBMs for the US nuclear arsenal. It also provides support for the Trident II D5 system for the US and the UK. It is also part of the joint venture that manages the Nevada Test Site, a key fixture in the US nuclear weapons infrastructure. Raytheon is involved in a project to stretch the life-cycle of the guidance systems of the Trident II D5 nuclear missiles of the US Navy. It is also involved in studies in support of the new W80-4 Long-Range Standoff missile for the US arsenal. Safran is part of a joint venture to build M51 submarine-launched nuclear missiles for the French navy, which each deliver multiple warheads. Its subsidiaries Snecma and Sagem provide the propulsion and navigation systems for these missiles. Thales is part of a joint venture to build the M51 submarine-launched nuclear missiles for the French navy. 1. View the list of official CANSEC 2018 List of Exhibitors. CANSEC 2018 (Canada's largest military trade show, Ottawa May 30-31), is organised by the Canadian Association of Defence and Security Industries). 4. 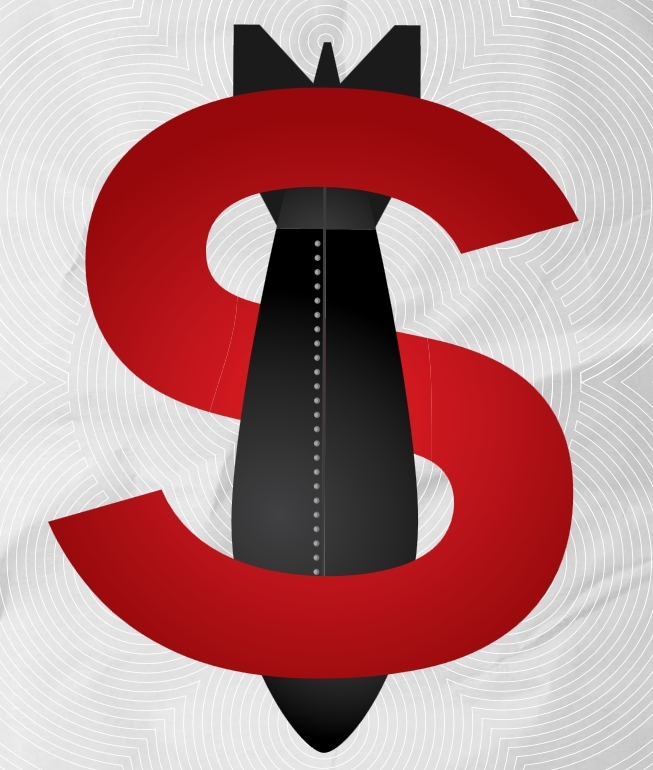 Don't Bank on the Bomb: A Global Report on the Financing of Nuclear Weapons Producers, December 2016. Principal Authors, Susi Snyder, Wilbert van der Zeijden, Maaike Beenes (PAX, the Netherlands). International Campaign to Abolish Nuclear Weapons (ICAN) and Profundo. * $8.38 Billion in the "World's 20 Worst Companies"
* $6.8 Billion in banks making US$18.7 Billion available to 7 cluster-bomb makers.